If you attended HeroesCon this past weekend you may have seen these folks around. They were small team of filmmakers going around gathering footage, interviews and insights about HeroesCon for their documentary about Shelton Drum and Heroes Convention. They’ve done a lot of work to make this film a reality and they need your help to finish it! They’ve launched a Kickstarter campaign with some great incentives and more to come. Check it out and please help spread the word! Thanks! My family and I had a great time this year…looking forward to getting a copy of the documentary! And we will, of course, see you all next June! 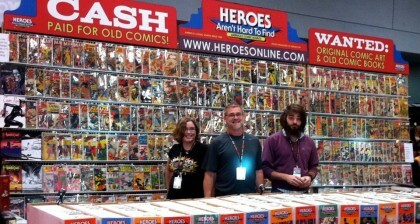 ← HEROESCON 2012 :: REPORTS, PHOTOS, VIDEO, & MORE!